See these two screws on the left? Think of the little screw as AIG bonuses. That big nasty long screw is AIG funneling $183 billion dollars of your money to foreign banks and to banks that already have wads of cash on hand. Those two screw jobs are not even to scale because the large screw would go past the page. Look those two screws over. Now which one do you believe Populist outrage should be focused on? 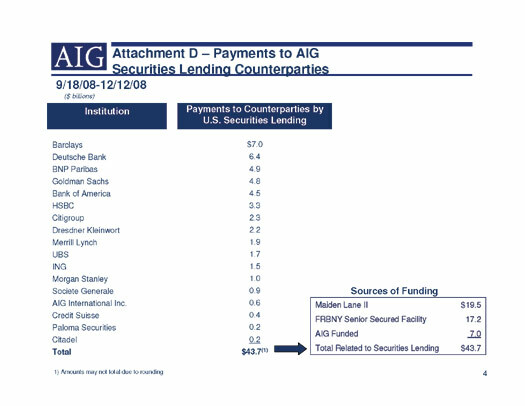 So we are all outraged over AIG bonuses. Now lets amplify that outrage to the scale of the ripoff. The bonuses are only 0.001 of the real ripoff that just happened. Your tax dollars were funneled through AIG to foreign banks and to U.S. banks for worthless assets. Your own blind rage is a smoke screen, being used by media elites so you do not see the real screw job going on. 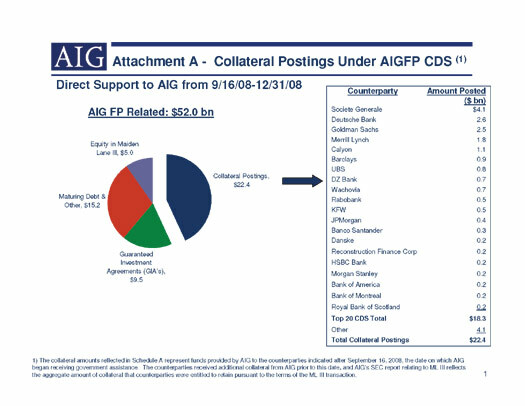 In an Instapopulist earlier we showed the AIG payout disclosure. Now I want to amplify those payouts. 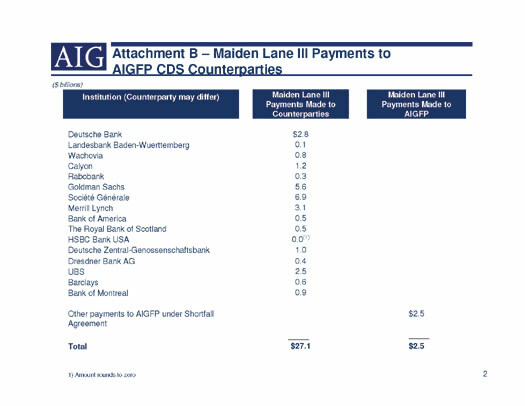 In the attached file AIG lists payouts to counter parties. What happened? Basically a bunch of companies placed bets, called credit default swaps, that home mortgages weren't so great and would probably go bust. 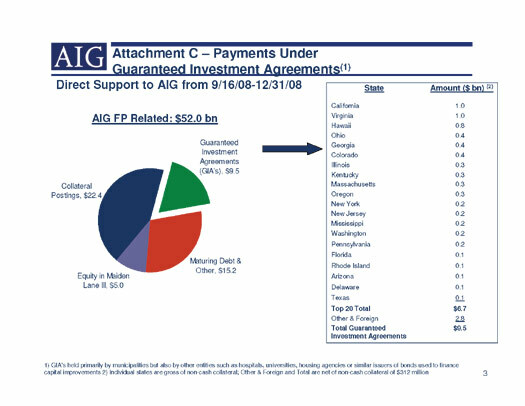 AIG (Financial Products), as the great global gambling hall, allowed these bets to be placed. Then AIG got a huge mega wad of cash from the government so they could pay out on these casino hall winnings instead of going bankrupt. Banks who won big are foreign banks and of course Goldman Sachs, former Treasury Secretary Paulson's former company. Think it's about unfreezing credit markets for you and me? Think it's about contracts? Don't you remember something about other nations taking care of their own banking system? Do you believe the United States should prop up the entire globe or payout U.S. taxpayer money to other nations? Contracts are broken all of the time and considering this is U.S. taxpayer money footing the bill to pay for the below banks gambling bets, yeah, a nation can break such outrageous contracts. This is especially true considering these very institutions are getting billions of your money from the TARP and Federal Reserve. Did you know Goldman Sachs bought an energy speculation firm while receiving TARP funds? Michael Hudson is calling for the Populist Outrage to demand the $183 billion back. Realize these payouts were not necessary for counter parties solvency. Which begs the next question from Paul Craig Roberts, Is the Bail Out a scam? 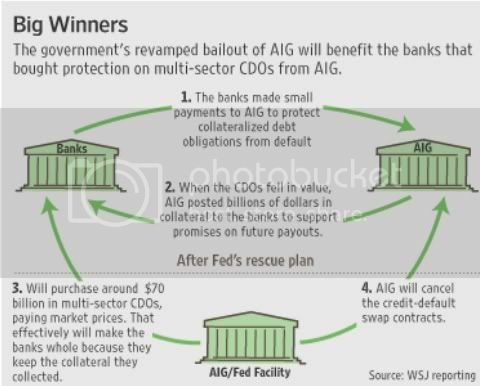 Indeed, AIG demanded another $30 billion in bail out funds by claiming systemic risk. In other words if we do not get the money, you all go down. But it appears they have intermingled their solid businesses of insurance with the Ponzi scheme AIGFP unit. So, where is the proof that this is true, that simply letting the AIGFP be cut loose and go die it's own insolvency death would cause a global economic collapse? While we have covered this topics previously, the incredible spin machine called 24/7 cable media pounding on the bonuses in addition to this Naked Capitalism's guest post, the mother of all scams, inspired me to link all of these facts together and try to amplify the true magnitude of the screws. We are looking at trillions of U.S. taxpayer dollars to pay for bad bets by Wall Street. The CBO has now said we are at unsustainable deficits. The recent actions of the Federal Reserve has caused the United Nations to recommend removing the U.S. dollar as the worlds reserve currency. Even more importantly, it is now highly questionable how necessary any of these bail out plans were. Finally, the many experts to us little ole' laypeople to Congress representatives have been screaming from the rooftops with detailed alternative plans that actually make sense. By ignoring these many experts and their calls is putting the United States at grave risk in my view. It's far easier to whip up the pitchforks & torches crowd if they've got a target to see bleed. In other words, I think AIG's being set up for sure- it's too big to succeed, but so is the 200 year old experiment of free trade in the United States. To protect the second, they're willing to sacrifice the lives of the people who are getting bonuses from the first. It's classic bait and switch method, used since the French Revolution, to keep populists from making real, systemic changes (like repealing Article I Section 9 to allow states to deal with foreign tariffs as they see fit).